So I'm having a bad day. Well, it's a bad week really. Anyway, it's one of those days where I only cook because I agreed to make lunch for our employee, I only do laundry because there's nothing to wear and I only wash the floor because it got peed on. Otherwise it's possible I would never move from the couch. I have grown a very large, very prolific cold sore. I guess that's what it's called although it looks like a mutant tumor multiplying rapidly and spreading horizontally across parts of my face at alarming speeds. The last while when I've been attacked by this virus I've ended up with enormous sores that don't heal up for weeks, at least it certainly feels like weeks. Today in my apparently weakened mental state I actually thought of Job and his boils and wondered if there was any comparison! I imagine it's all part of the aging process, these ever-increasing sores. In ten to fifteen years I'll probably have ones that cover most of my body and take up to six months to heal. [Insert sarcastic shrug] I should just be so thankful this one only covers an eighth of my total lower face. No doubt you too can see the merits of this method and understand perfectly why I would want to use it. But let's not discuss potty training. Let's talk about Anne Lamott's book Operating Instructions: A Journal of My Son's First Year instead and hear what she has to say about those kind of days. As a new mom journaling her first year of motherhood, she writes from the heart and I love her descriptions of some of the finest as well as the not-fine-at-all moments. Though the language can be a bit crude at times, it makes her that much more relatable (well, okay, for me!). One of Anne's journal entries mentions that "Things are getting better now. They've been easier for a month. [...] It's much better. I'm much better." The next entry just four days later begins "I'm mental and defeated and fat and loathsome and I am crazily, brain-wastedly tired." Isn't that exactly how we all feel some days? Together these two perspectives aptly describe the ups and downs of parenthood and really, all of life in general. 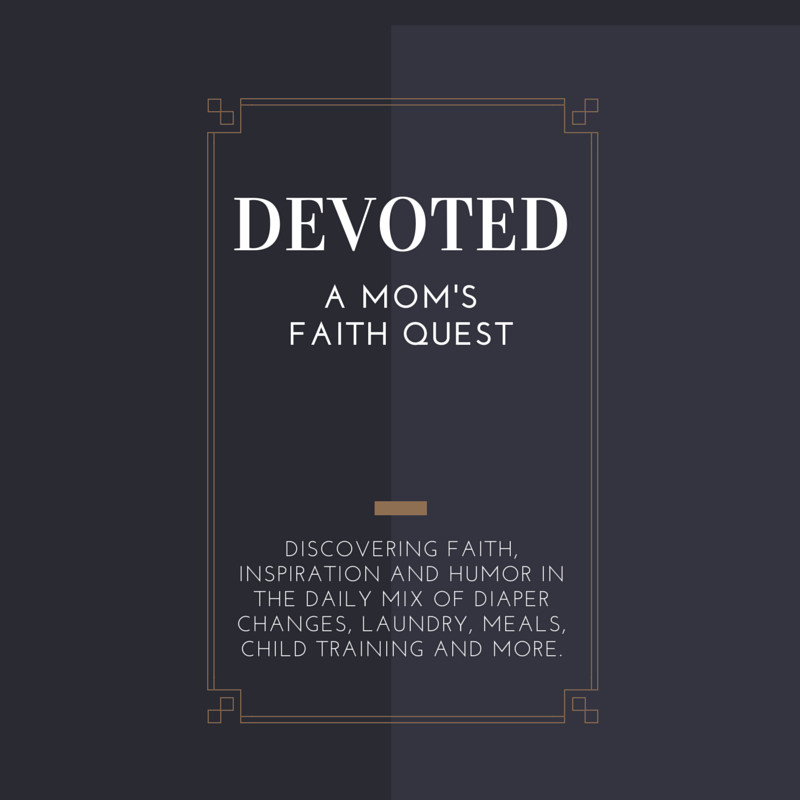 After singing her son's praise and extolling his virtues often throughout the book, there is a day that Anne casually remarks, "Yesterday [my son] Sam was horrible, whiny and wired and just in general the most worthless and irritating little person." Again, she has precisely captured one of those parenting moments that we all pretend not to have. "My mind is a bad neighborhood that I try not to go out into alone." This one is so aptly put. On one of those days it's imperative that I don't go hang around in that unsafe neighborhood of my mind too long alone. Nope, I've got to take someone with me or stay away all together! Sometimes there's nothing to do on days like these but ride it out. 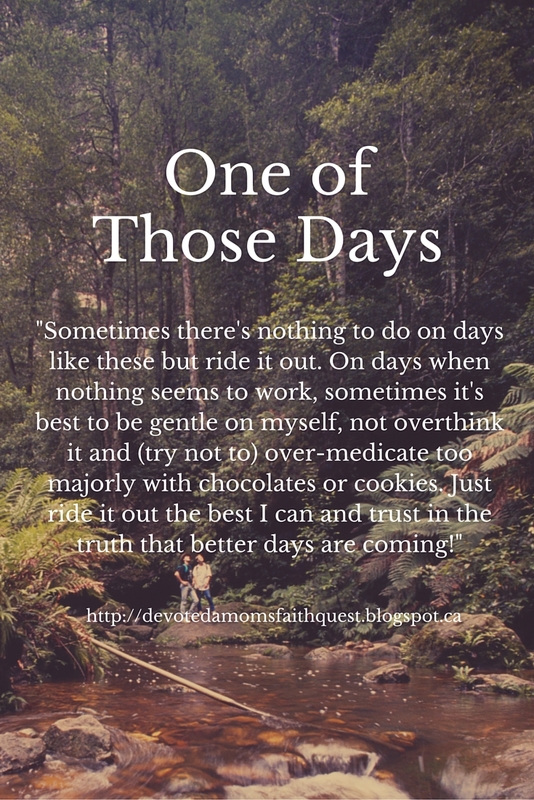 On days when nothing seems to work, when my mind is weak, the cold sores loom large and the potty training program dissolves, sometimes it's best to be gentle on myself and not overthink it and (try not to) overmedicate too majorly with chocolates or cookies. And, especially not go into bad neighborhoods alone. 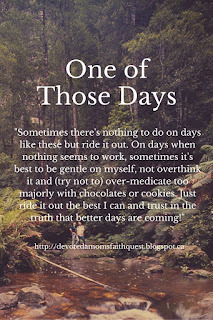 Just ride it out the best I can and trust in the truth that better days are coming! Here's to better days ahead! !